The Pro Analog MK III is a slight twist on the famed Sola Sound MKII Professional circuit- One of the greatest sounding vintage Germanium Fuzz guitar effects pedals of all time! The ProAnalog MkIII Fuzz pedal features a slightly wider dynamic range between low gain and high gain than the MkII. It is also designed to work nicely in the chain after Wah Wah pedals- something not all fuzz pedals can claim to do. Sweet chewy fuzz with killer sustain that cleans up nice with your guitar volume are the Pro Analog Mk3’s claim to fame. Each Pro Analog MKIII is hand made with the finest components including NOS Germanium Transistors and Bud Box housings. These boutique Fuzz Pedals feature top notch construction! 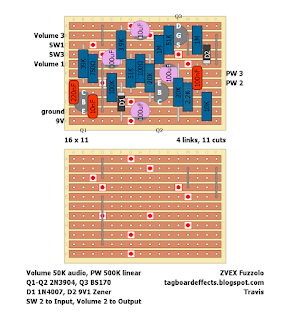 The main goal of ProAnalog Guitar Effects Pedals has always been pure tone! Not clever names, Fancy boxes, or Gimmicky paint jobs. If you are looking for a no nonsense fuzz pedal with professional quality tone, then the ProAnalog MKIII is the right choice to make. The ProAnalog MK III is one of the best sounding fuzz pedals that we've heard! PERIOD. Keep in mind this is a Tonebender II variant, so you can try any transistor set that would work in a Tonebender MKII, and give it a try. So keep in mind the gains and leakages. Also, while it's not written in the layout this is an PNP device so if you want to daisy change it you need an inverter. This is Brian's version of Bajaman Optical Limiter. Here you can find the original thread. 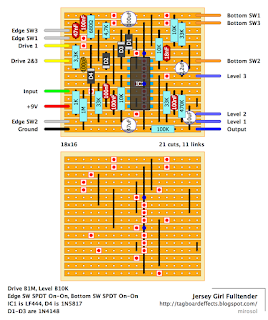 You could swap D3 with 100R resistor and 100uF cap with 220uF if too noisy. Rev2 addresses slight error pointed out by our friend Mr. Bond. 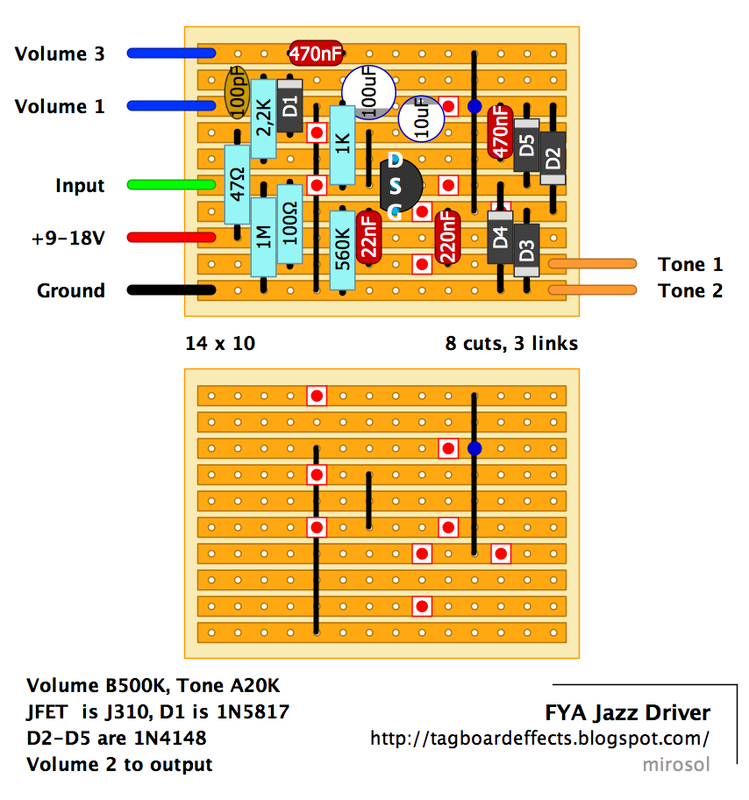 Should not affect tone or behaviour too much..
Nice and rather interesting modernization/take on the Fuzzrite. Not that common pedal up here in europe. I guess it's the same with U.S. Anyway. 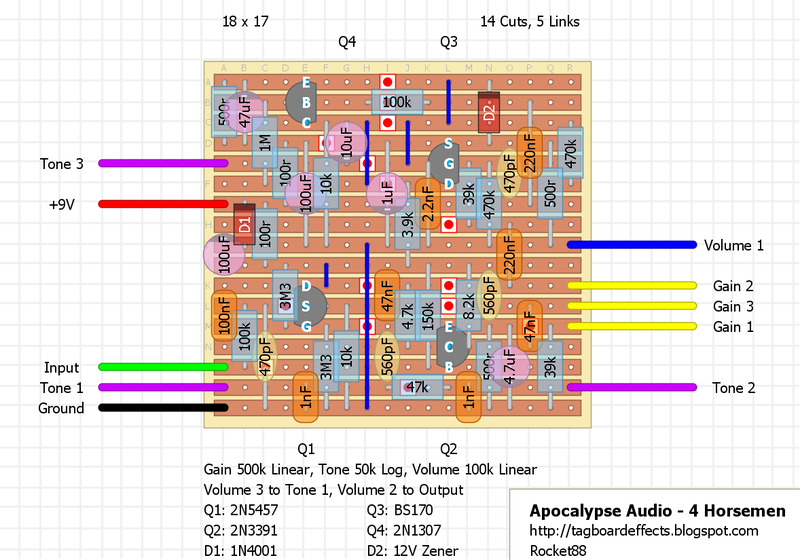 Somewhat interesting take on a TS/OD808/SD-1. Why not post this one here too.. My short description + a schematic at FSB. One last one, for tonight. well, i came up with another dirt pedal the other day. lately, i've been experimenting with mixing different types of transistors together to achieve new tones, and this one kind of takes that idea to the extreme. it's designed under the premise that the stages increase in breakup as it goes along in the circuit, but instead of using stages that increase in gain, different types of transistors are used that exceedingly distort as the the circuit progresses. 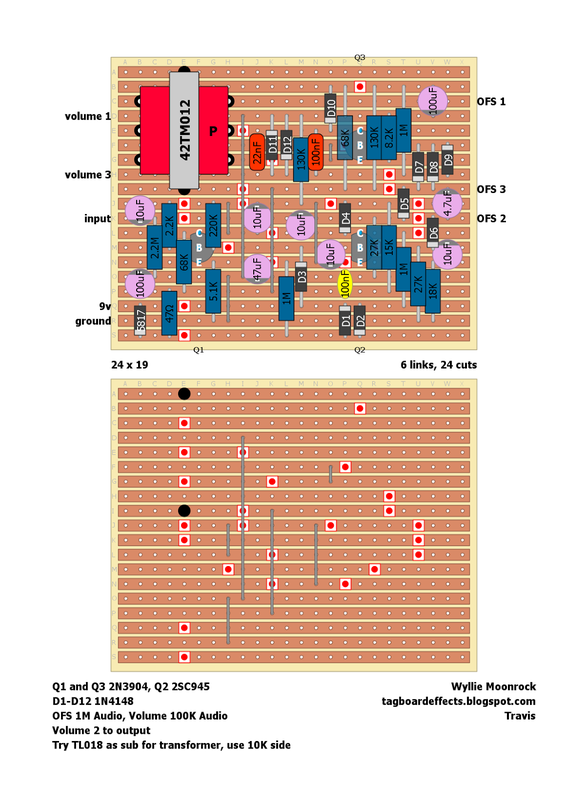 for instance, the first gain stage is a silicon BJT. this is used to get a decent push going and a very slight amount of drive. next, is a MOSFET transistor, which like to distort a little easier, and in a bit more pleasing and richer way than the previous Si transistor. finally, there is a germanium stage, which of course loves to distort in a very full and heavy overdrive, especially when driven by the previous gain stages. the result is a very clear, yet complex crunch, that has a very nice character to it. 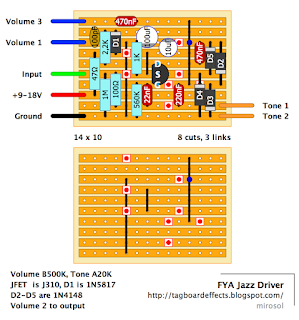 to round things out, in the beginning of the circuit is a JFET buffer, which helps to increase the current, and gives a nice high input impedance for the guitar pickup to see. 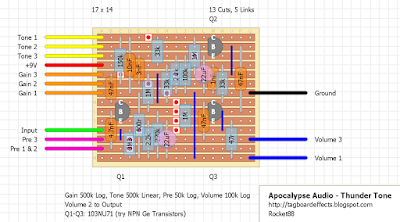 so in the end there is a total of 4 different types of transistors, each of which i tried to use to their optimum potential. hence the name, the Four Horsemen Overdrive. the tone control is a variation on the SWTC, but it has an added pole for a steeper rolloff. the frequency point where the curve begins is rather high, so it is really more like a presence control- just taming the highest of frequencies, keeping the basic tone intact. here's something i churned out the other day. i have been thinking about modeling the Supro Thunderbolt with FETs, but then thought- i just got in these cool new Tesla GE's, why not use those? so that's what it is, the preamp section of the legendary amp used by Page and supposedly Hendrix, done up NPN germanium style. i had to eliminate a few resistors towards the end to bring up the volume and lowered the value of an emitter resistor to up the gain a bit. also, i made the resistor on the input variable so you can adjust the input impedance for guitars with different pickups. 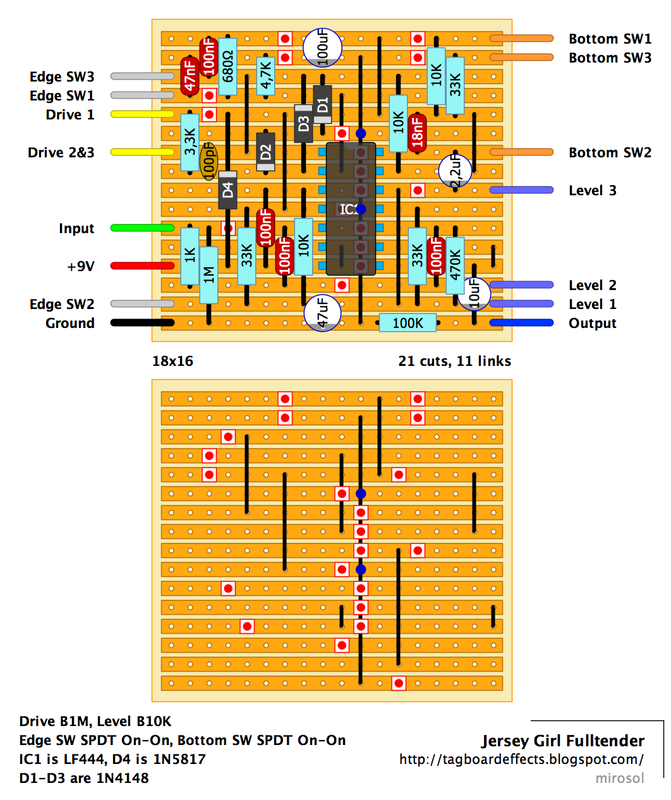 the real gem of this circuit is the tone pot- totally counter-clockwise you get a nice full range tone with plenty of mids. 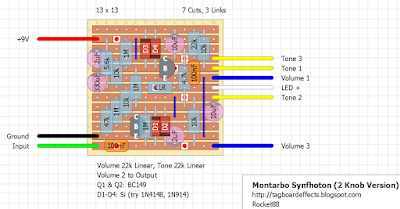 as you go clockwise it goes to a very muffled tone, and as you go even further, it goes to a very thin, cutting tone. there are some very cool sweet spots, and a lot of versatility. 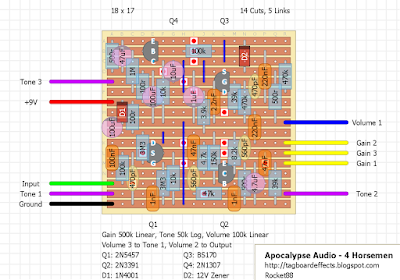 i like it better than a regular muff style control, but it does cut plenty of signal- hence the two gain stages after it. it's a cool sounding circuit. nicely voiced and does a good overdrive type sound. if you don't have the trannys, you could change out the 33K Rc's to trimmers and adjust to taste. the tesla trannies are extremely consistent, so no trimmers needed. the layout below uses some large axial caps and is yet unverified, but hopefully i'll get it done sometime soon. Continuing with the layouts I made that day. Here's the fifth version of the dirty boots. It's a germanium overdrive based on the first version, there's an additional pre-gain pot that controls ho much signal is entering the effect. 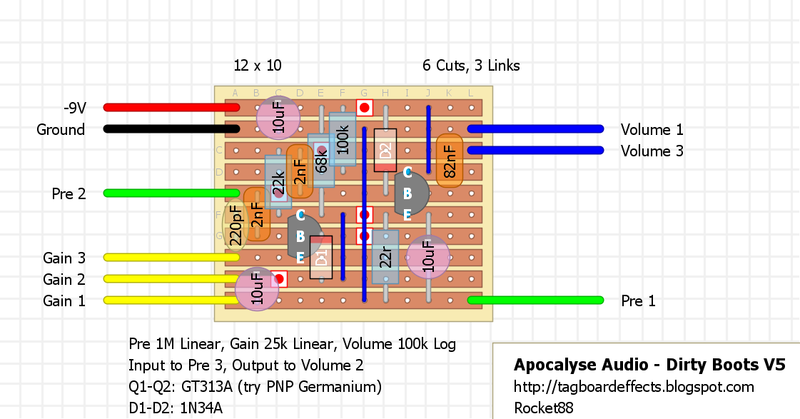 So the other day I was looking over some of the info RnFR has posted on Apocalypse Audio and came across some pedal designs that caught my eye. I ended up sitting and doing a couple layouts for a few of them. Here's the sixth version of the dirty boots. It's a germanium overdrive based on the first version, but i with a couple extra controls. 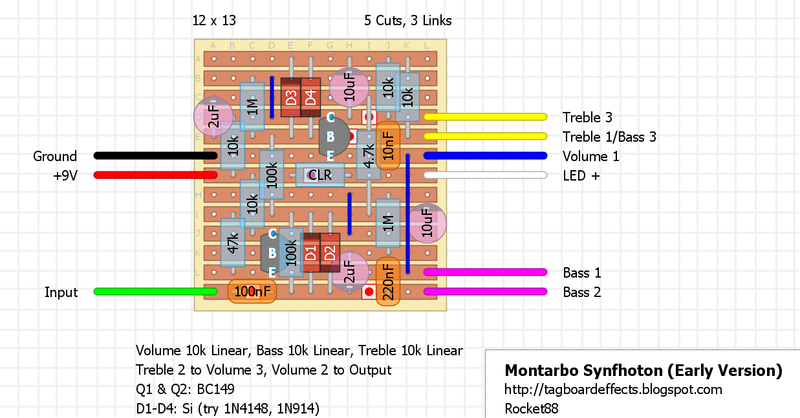 There's a pre-bass and post-treble tone control combo that's based on similar methods used in many distortion pedals. Recently traced. So here it is. Very decent sounding thing, especially when we take into account that it is sort-of LPB to Hemmo's BazzFuss - with starve cotnrol. 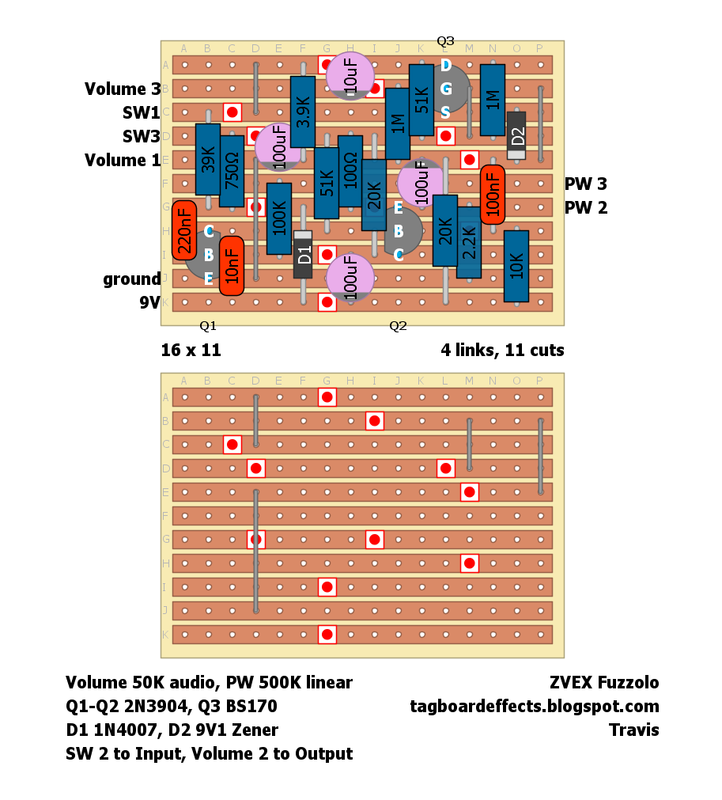 I personally have a strong dislike to pedals which have more than one knob (level/volume) that can kill the signal by dumping all of it to ground. Therefore, here's a slightly modded layout. My mods are just those two resistors labelled "2.2K*". To make it verbatim, just replace those two with links. Or check the schem at FSB and have your own way with it. Oh. One more thing. As this one has heart warming, way better than usual, polarity protection method in use, i left it as it appears on the original. Built one for myself and... The first one works as well as the "fixed" layout, but there are couple of things i wanted to address. First, the "starve" was in reverse. 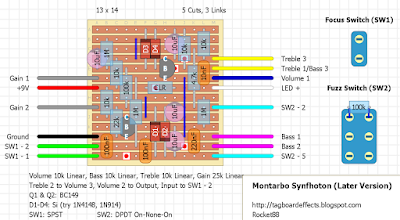 I wired it backwards in the first layout - as to me, starve means that you are limiting more of the current. 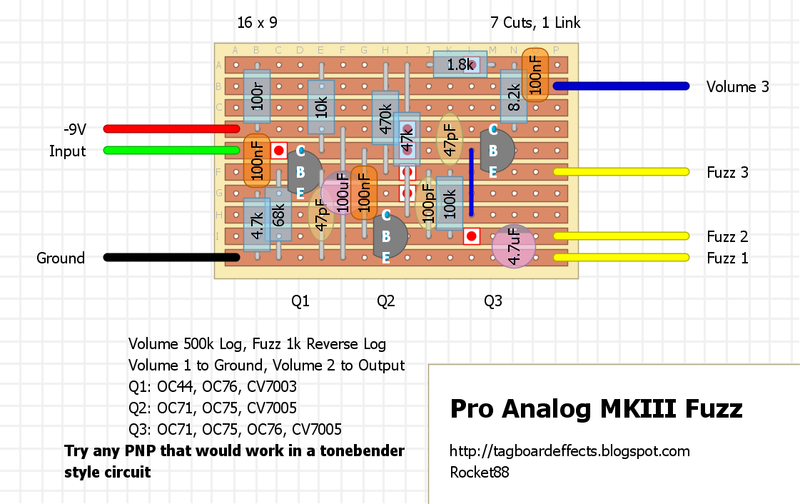 Now it works in a way that makes more sense to a user, but way less sense if you know anything about electronics. (One should not call anti-starve a starve. Grrrrr.) And the 100K logarithmic wasn't very good to me, so i swapped it for 50K linear. Then. The 2K2s i suggested. Yes. 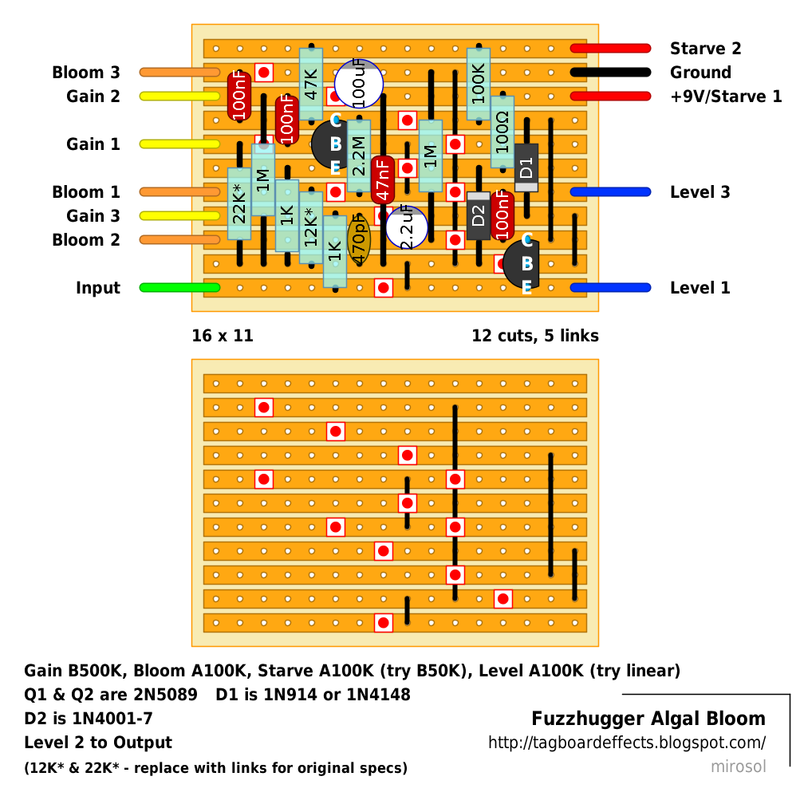 They will make the sound travel through even when "bloom" and "gain" are fully CCW. However. Those values i pulled out of a hat do not perform very well. After careful measuring what value of resistance between pins 1&2 of those two pots works the best, i settled for 22K at "gain" and 12K at "bloom". 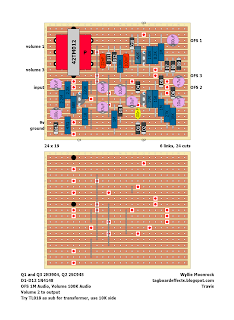 With these values, the volume is somewhat close to unity when all pots are at CCW - except for volume. The sound is very pleasing. It ranges from overdrive tones to massive fuzz to Octavia-like weirdness at the "bloom" maxed. Very decent circuit. I'd personally call the controls "Water Temperature", "Air Temperature", "Length of Summer" and "Master Volume". That's how you'd make algae. Either way. Call it verified. From what I've heard this will give the usual octave fuzzes a run for their money. Looks very interesting! 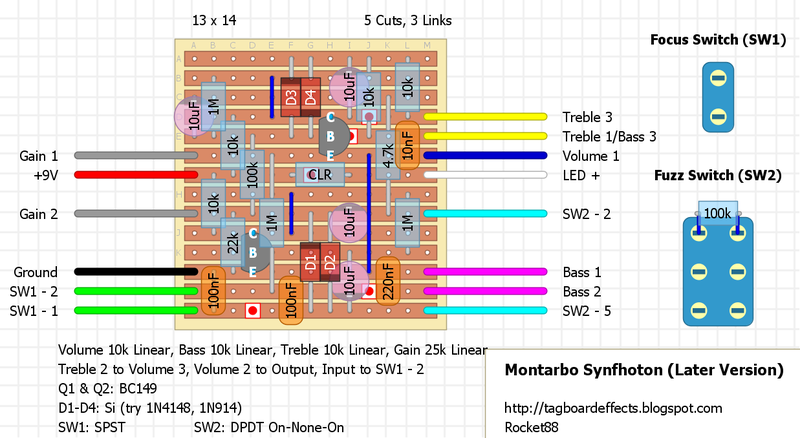 Well I said that I would post a layout with a bunch of modifications to the Montarbo Sinfhoton based on what I've read people have already done. So without further a due. 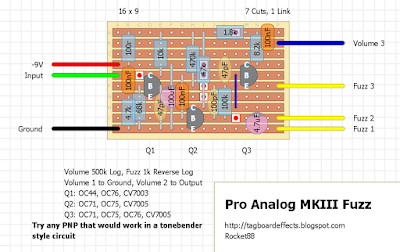 Removing the 100k resistor that's in series with D1 & D2 will increase the amount of fuzz, so you can lower it for more fuzz, raise it for less fuzz, or put it on a switch for 2 different settings. 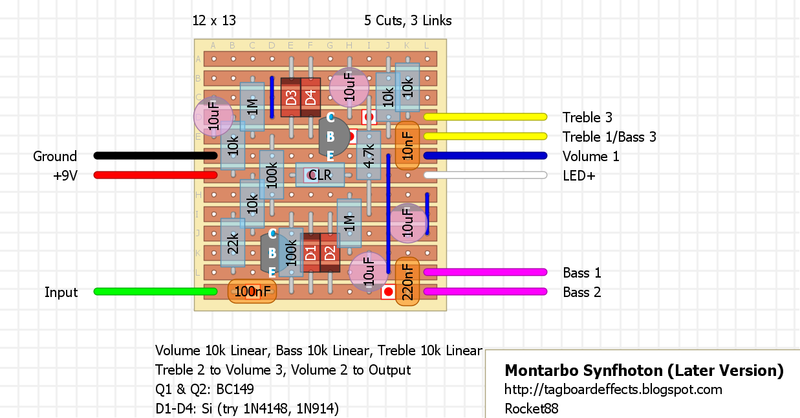 Hell, you can take and have 3 different settings using different combo of resistors. The "Focus" switch, by putting a cap to ground at the input increases the compression of the fuzz and can provide a subtle boost in output. 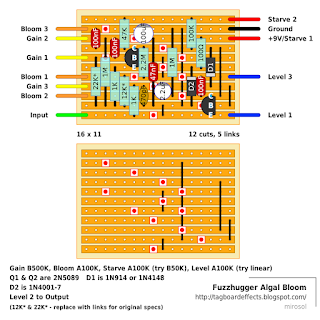 The gain control I explained previously, but apparently putting a pot in series with the 22k or 47k resistor to ground gives a fuzz control. 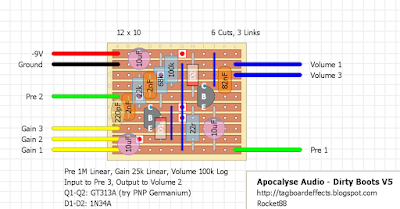 Johnk had used a 25k Linear pot, and raised the resistors value to 180k. 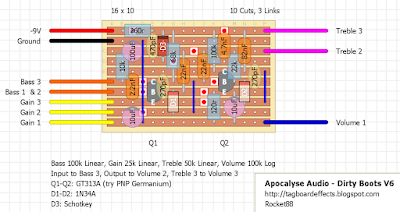 Notice I used the "Later Version" to make the modified layout, this is because from reading a lot of people preferred the 2uF caps being raised to 10uF like the later version. BTW, you can use 2.2uF I just wrote 2uF because that was in the original schematic. As far as transistors go it seems higher gain transistors, >500hfe, people seemed to prefer, but I didn't read a lot about how lower transistors sounded. 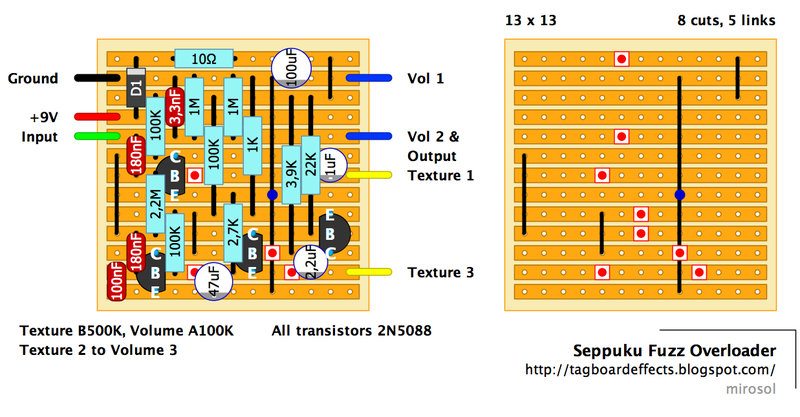 To me this looks like a really stripped down and modified Big Muff, essentially just the clipping stages, I would think some of the transistor tricks for the Big Muff may work out here, but no idea. Here's a pedal that caught my eye while looking for a new fuzz. It was made by an Italian company in 68. It's very Big Muff like in tone, but seems to have a bit more clarity in the notes, and no Fuzz control, just Bass, Treble, and Volume. 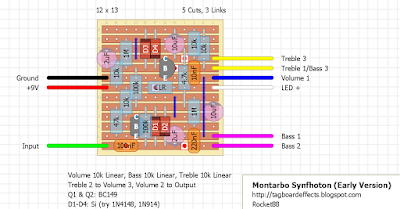 In my search for the schematic I found that over time there's been 3 different versions, so I made a layout for each, and then found that a few years ago by Miro actually made a layout for the later version. 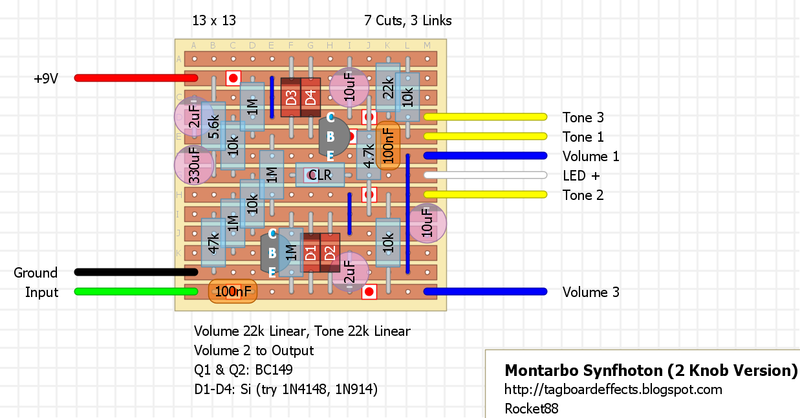 My layouts are a bit more compact, has less cuts & jumpers, and I put the CLR for the LED on the board, so I thought I would still post all of them, since while they have the same feel, each sounds a bit different. Also, through my searching I found some mods people have done, and made a massively modded layout as well that I'll post later with a description of it all. The video compares the stock vintage unit to a clone made by Brad at Creepy Fingers. Not sure what the extra pot does, but since it's full CW I can only assume it's a Fuzz Pot. 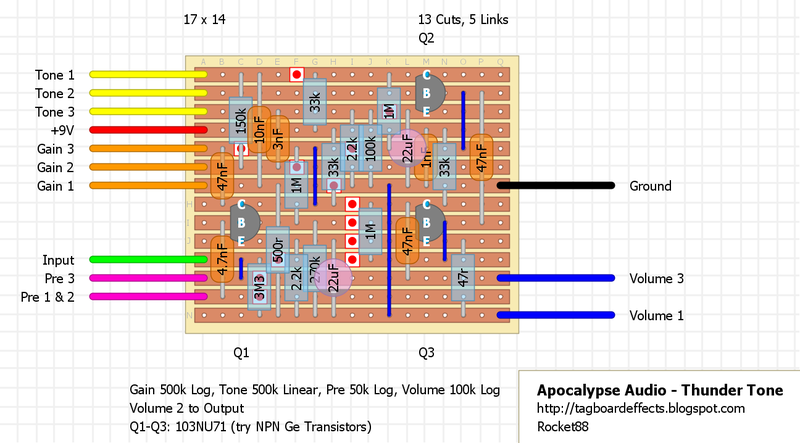 You may need to adjust the 2 10k resistors to the Collectors of Q1 & Q2 to bias the transistors right and have it sound good. Since BC149's are hard to come by, although I've seen them on eBay, you may want to try the usual suspects with higher gain. 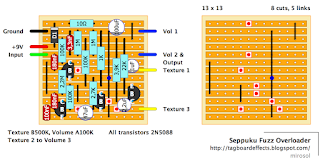 So transistors like 2N5088/2N5089, MPSA18, BC109, BC108, etc. For the 2 knob version you may want to change the 2uF caps to 10uF caps like the later version. For more fuzz remove the 100k or 1M resistor parallel to D1 & D2. I left out the usual 1M pulldown resistor as in all the videos I heard I didn't hear a pop from the vintage unit, so I felt it's not needed, you can always add it on the switch or just add an extra column. Madbean's great new project based on Wampler Faux Analog Echo Delay. 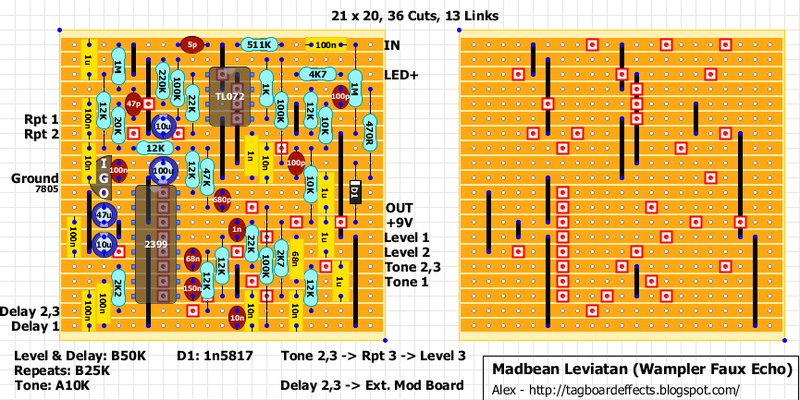 Madbean's great new project based on Earthquaker Devices Sea Machine. Changed 33n cap to 3n3 and 10k resistor from PT2399's pin 14 back to 1K.